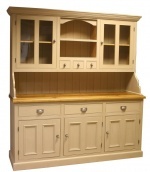 Period House Store has created Bespoke Kitchens for over 15 years using skilled craftsmen to create wonderful individual kitchens with timeless looks at an affordable price for a handbuilt kitchen. Many of our kitchens are are local to us in North Yorkshire, but we have supplied kitchens across the UK and can offer a full design and fit service. We generally use The Little Greene Paint palette, which after years of experience we find gives the best results, we also have an extensive collection of handles and accessories to choose from. Our in-house designer works closely with our clients to create a detailed plan which is a free of charge service, this includes a home visit, plans and visuals with a detailed quotation. We also have an installation team if required. We supply a wide range of solid surface worktops, including granite and silestone as well as several option in oak. Our clients can visit the factory to view the wide selection as viewing a very small sample of granite is quite often not enough to get a real feel for the product. We offer a full template and fit service. Below is a selection of our more popular pieces, however everything we do is built to order, so the choices are vast. 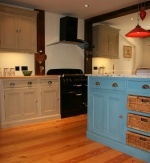 If you have a design you need a quote for please contact us and we will happily provide you with a detailed quote.